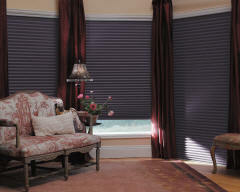 Custom Blinds & Design popular pleated window shades feature crisp, pleated fabrics in an extensive selection of colors and styles, including weaves, patterns and textures. This collection features a state-of-the-art, patented, honeycomb-within-a-honeycomb design offering the industry’s highest level of efficiency. With a wide array of fabrics, pleat sizes, colors and textures. 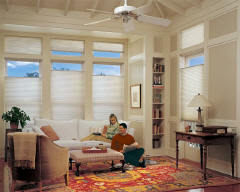 Duette® Honeycomb shades enhance any décor and provide superior energy efficiency. 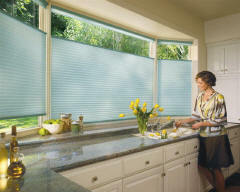 Applause® Honeycomb shades are the right choice when looking for energy savings and value with the enduring quality of the Hunter Douglas brand.